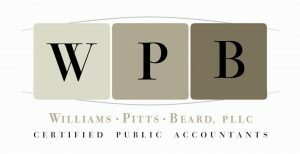 Williams Pitts & Beard, PLLC is an accounting firm that provides services including QuickBooks consulting, training, and troubleshooting, as well as business and personal income tax planning, tax preparation and consultation, business write-up, and payroll services. They also do compiled, reviewed, and audited financial statement preparation, and more. Work For Williams Pitts & Beard, PLLC? Claim This Page.